Here are the ones I made ball ones to match yesterday. ...that I haven't shown off stuff I have made during the past few months. I'll make a few separate posts and schedule them to spread it all out, else this one would be too picture heavy. First out: I made some teapot cozies to help keep my tea warm! I have been messing with my hair lately. 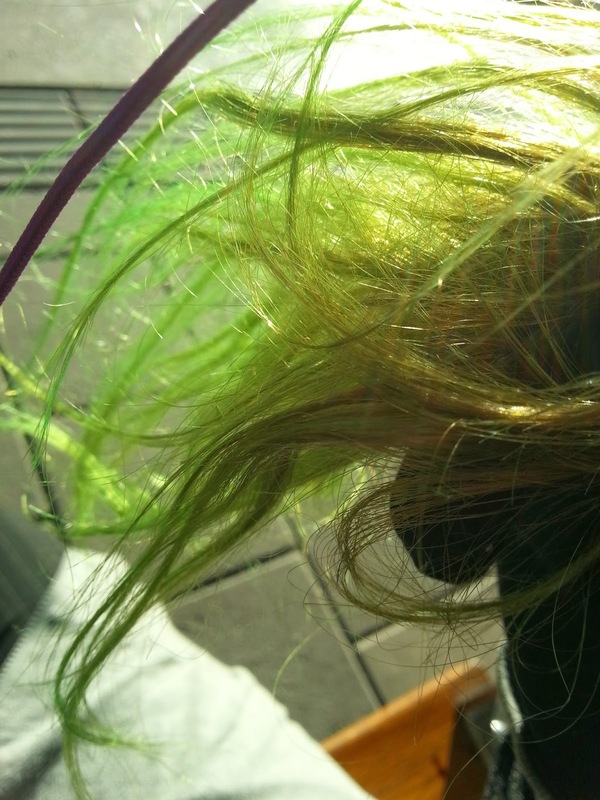 I don't have photos of all the shades it has shifted through but here are two, turquoise and neon green (the photo of the green was taken before I re-dyed it, it became much brighter and more saturated after the second dyeing). Alasdair does not try to kill me if I put him on my lap, unlike Olivia. 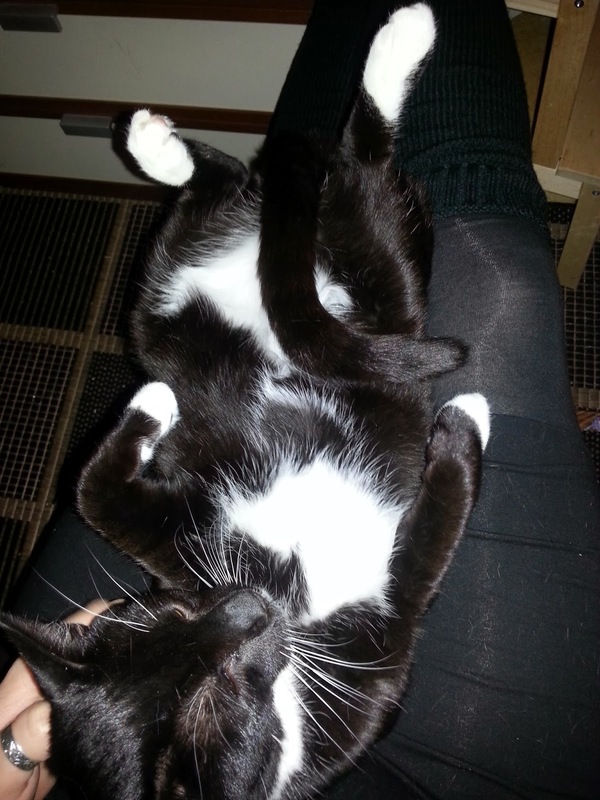 He likes snuggles and will fairly reliably start purring and twist over on his back for bellyrubs. Olivia is a thieving thief. So far today: Money, not retrieved (a few dollars worth of scandilander coins that she took in her mouth and ran, wtf!). My good non-painful toe separators, one retrieved with tooth marks one missing (not sure where they were, I thought they were in the bathroom which is closed). A wooden heart with a piece of string that I was going to use for an xmas gift, retrieved. A crochet hook, retrieved. My entire ribbon stand with twelve rolls of ribbons, not yet retrieved. I am going fonduing with coworkers tomorrow (snerk! I can't think of fondue without Captain America references anymore, sorry), and decided it warrants a fresh mani without tip wear. 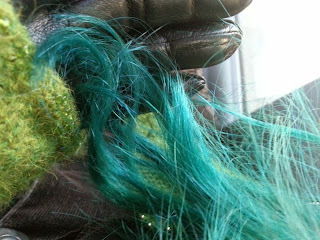 I had to patch to get a wide enough picture for the thumb - can you see the line where I restamped to fill in the edge? Not quite a mannequin nail colour as a base, but one of these days I will find the perfect colour. Alasdair no longer purrs silently, but so loudly he could wake the dead. He is turning into a lap cat - if I can catch him. I don't want to make a habit of chasing them down, though, so we are compromising a bit and saving cuddles for morning and evening before I let them out of the cat room (they still sleep in the hallway, both to let me sleep and because they seem to feel safer in there, the world is still a bit big). He is more trusting of me, and always interested in food. FOOD. And he loves being brushed. Actually, so does she. And petted and loved - on her premises, the few places she feels safe. If she feels unsafe and I get too close she tries to kill me. I have bloody stripes all over my body as a result. She is tougher in the surroundings generally though, explores a lot. She likes to carry stuff around. On my lap, purring his little heart out. I've been on sick leave for pretty much two weeks (gone to work three days and gone home after lunch those three days). Back to work tomorrow, I wish I felt healthier than I do. Don't want to collapse again. It's supposedly a sinus infection that my body couldn't beat back, doc gave me antibiotics last week. I don't feel all that much better though. Will see how I handle tomorrow. For now I did my nails, wouldn't do to appear at work with chipping torn apart nails, now would it?